Data Guy gave a presentation at the RWA conference this week, and yesterday he posted the slides to the Author Earnings Report website (as a 128MB PDF - WTF?). He revealed to attendees what many had long suspected: romance titles dominate the US ebook market. As you can see from the slide below, romance titles make up 4.4% of print sales (according to Nielsen) and 45% of ebook sales (according the Author Earnings Report). Yes, 89% of romance sales in the US are digital, and much of that goes to indie authors rather than publishers. Before we dig into the data further, here's a question to ponder: how many of those romance titles are actually romance titles? The thing about the AE Report is that it classifies books based on which category they're listed in, not based on their content. this means that the data we're looking at includes titles that a purist would tell you is not romance (no happily ever after). That said, the data shows that far more indie authors are making a living at writing books than any other type. This is the one category in the bookstore which is the closest to achieving a post-publisher market, and that is largely due to Amazon and the Kindle. Amazon.com accounts for 74% of the ebook market, by the AE Report's measure. And when it comes to romance titles, a lot of that revenue comes through Kindle Unlimited. 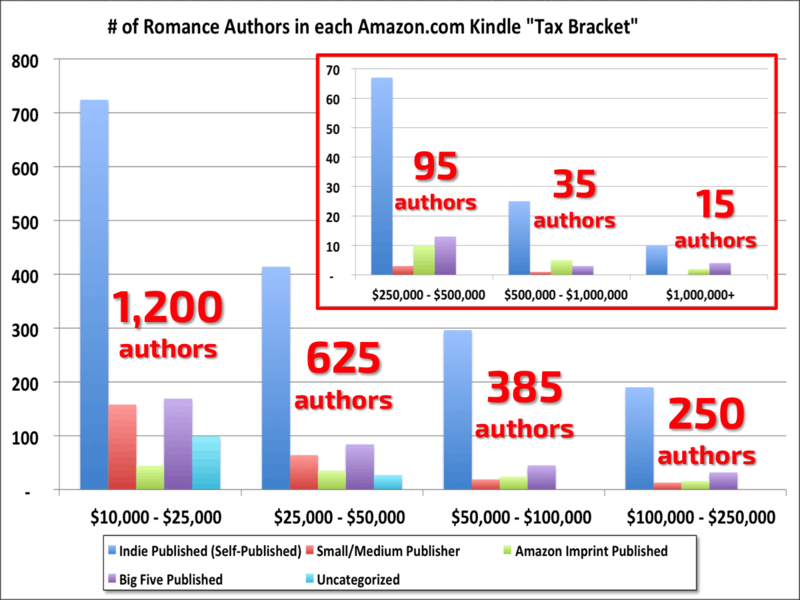 The slides show that romance titles in Kindle Unlimited earn an average of 2.5 times as much as the romance titles not in KU. Speaking of earning more, the slides also show that romance titles from indie authors are more likely to continue to generate sales in the months and years after they've been published. You can find more details on the Author Earnings website. The 2.5 multiplier isn’t due just to the KU payouts, going by the quoted author earnings. Going by that and his observation that authors with deep catalogs rotate titles in and out of KU it seems KU really does work as a discovery tool, sending readers to buy books not in KU. It was also interesting to see his data showing that permafree is a net money loser for series with less than seven titles.